Attachments is set in a newspaper office, just before Y2K hits, in smalltown USA. The Internet is still a novelty and two members of staff - Beth and Jennifer - spend time sending emails back and forth. Lincoln is the Internet security officer hired to ensure that staff aren't abusing the new email/Internet privileges, and find himself drawn into reading their emails each night. He learns about every aspect of their lives, from the musician boyfriend of one to the pregnancy woes of the other. Before he realises, Lincoln is falling in love.... but how can he possibly tell this girl why he knows so much about her? Is there any chance she could ever forgive him? And does she believe in love before first sight? This is a perfect chick lit book - it is humorous (and I do mean laugh-out-loud at some points), it is very sweet and it is wise about the ways of love and relationships. 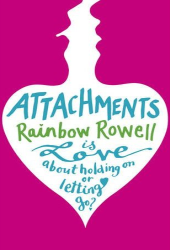 I found myself entirely bowled over by Attachments and read it in one sitting. Part of the reason for this is the delightful format that Rainbow Rowell uses. I've seen the email plot device in other stories, but here the conversations between Beth and Jennifer are interspersed by third person encounters with Lincoln, and all the areas of his life. Because of this, it felt both immediate and very intimate. Lincoln himself is a *wonderful* character, and shows tremendous growth through the course of the novel. Usually we see our leading ladies develop into meaningful human beings in chick lit books, but here it was all about Lincoln. A victim of a broken heart, he has lived with his mother for a while at the start of Attachments and spends his Saturday nights playing D&D with friends. His night shift work precludes him from meeting people who keep normal hours, and he finds himself lonely and out of touch. Under these circumstances, it seems almost reasonable that he would be drawn into the warm and happy lives of two friends who gossip and tease each other to get through the work day. The lack of privacy concerning Beth and Jennifer's emails - and the fact that Lincoln reads them - could be a source of discomfort to some readers, and might make Lincoln a person that they feel unable to sympathise with. I didn't have this problem so much, since every office I work in has some form of Internet security where emails are monitored. Saying this, I would be deeply uncomfortable at the idea of someone reading all of my personal conversations with a friend! I found that that prose in Attachments, plus the snappy dialogue, lifted the novel above your run of the mill chick lit novel - this is definitely a superior example of the genre, and one that I would feel very comfortable in recommending to someone who wanted to dip their toe into this style of novel. I also liked the location. Most of the chick lit novels I read are either located in Ireland, London or New York, so to be given such a refreshingly different location - with all the culture and food and sayings that accompany it - was a real breath of fresh air to someone who has read a LOT of chick lit books. For me, Attachments is one of those rare beasts - a genre novel that actually becomes more. Becomes something you would enjoy reading time and again, and want other people to read in order to savour the goodness. A really excellent novel and well worth your cash - this one is a keeper! I am not a chick lit fan. Not usually enough zombies or mayhem for my taste *g* but you are swaying me with this one. I might have to check it out.